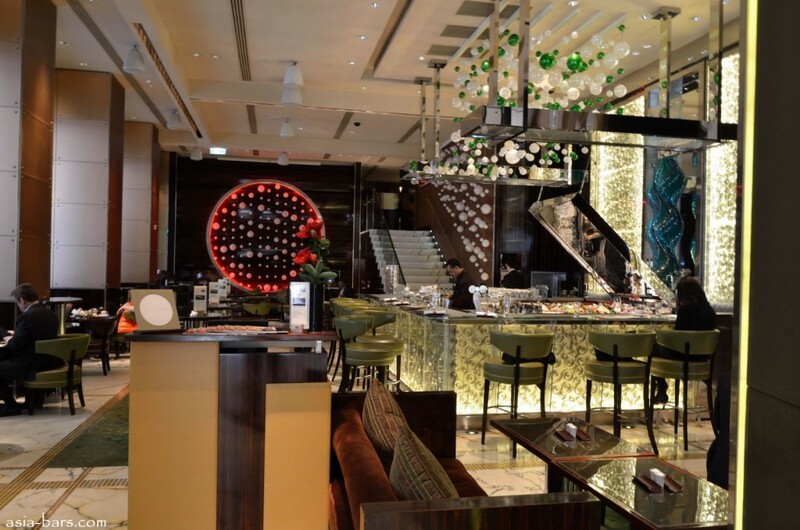 If you are looking for a smart and upscale place for lunch in Central without the (unreasonably) smart price tag, then MO Bar at the Landmark Mandarin Hotel is the place to go. I took my mother there for a pre-birthday lunch today, as she has been singing praises about their Hainan Chicken Rice for ages (“the best in town!! !”, she says), and it’s only the best for my mother. I called in the morning and they were fully booked but they kindly said they would squeeze us in, and when we arrived we were shown to a very nice table. Our main waiter, in true Mandarin form, was gracious and informative. He was there when we needed him, and yet seemed to vanish when we didn’t. He expertly guided me through the menu, and demonstrated some remarkable NLP skills – so that even though I only planned to go for a starter and a main, I somehow managed to fold for a dessert and a glass of wine too. They serve a nice sun-dried tomato bread, which was nice, soft and fresh, but nothing fabulous. 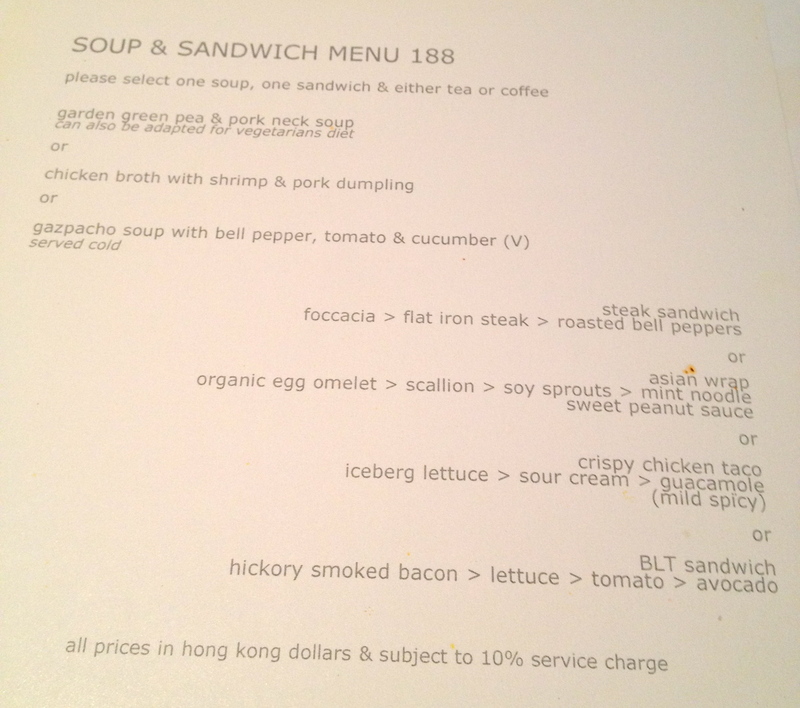 The venue is chic yet casual at the same time, and while the set lunch menu is more expensive than your average lunch in Central, it’s still not going to break the bank at $228 for 2 courses (including tea or coffee) – that extra bit is really worth it for the ambience and quality of ingredients they use. The meal comes served at the same time on a double plate. 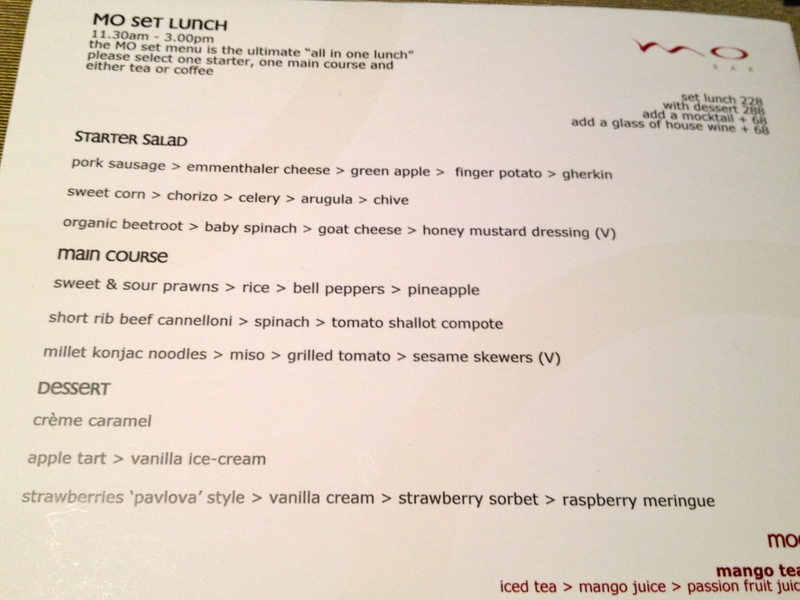 While it certainly makes for an efficient lunch, on this occasion I might have preferred if it was served separately. The sweet corn salad was a great mix of flavours – light and summery with just a hint of naughtiness with the chorizo and a really nice dressing, this really hit the spot for me. I’ll be repeating the combination at home! 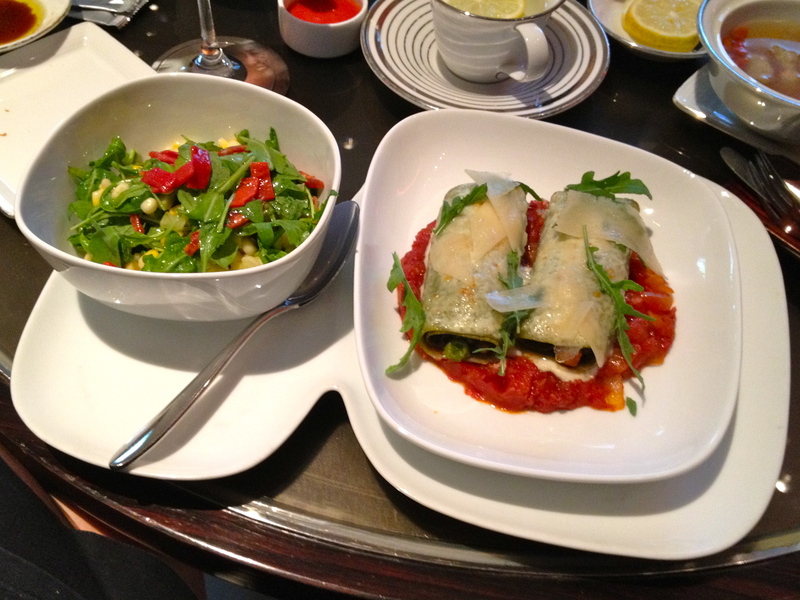 The beef short rib cannelloni was nicely flavoured and the tomato compote balanced the dish with a nice bit of sweet/sour. A bit heavy for a girls lunch, but hey, you don’t have to finish it! 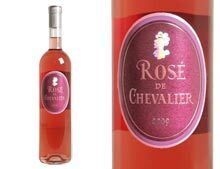 To accompany, I ordered a glass of the Rosé de Chevalier, “a beautiful rosé wine from the Bordeaux wine region, unusual as many rosés are associated with the south of France”, the waiter explained. It was also the only rosé selection on the menu, but I enjoyed it. Reminiscent of summer in Corsica, it was a beautiful salmon pink colour, with aromas of cherries and strawberries. 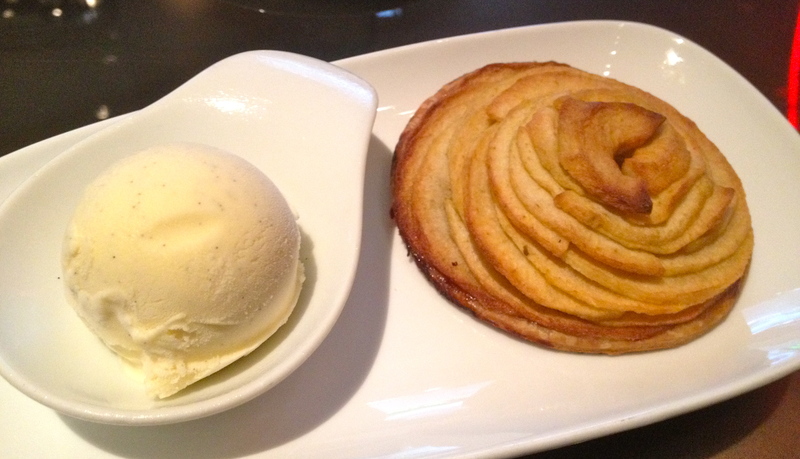 The apple tart was surprisingly light, and as the waiter explained to us, was composed of a very light puff pastry, fresh apples baked with no added sugar (goodness, he knows how to make a woman order a dessert!). The Hainan Chicken Rice IS really, really good! The portion of chicken is very generous, it’s accompanied by a frangrant and moist bowl of rice, as as well as a wonderful, flavour-packed double-boiled soup with goji berries. 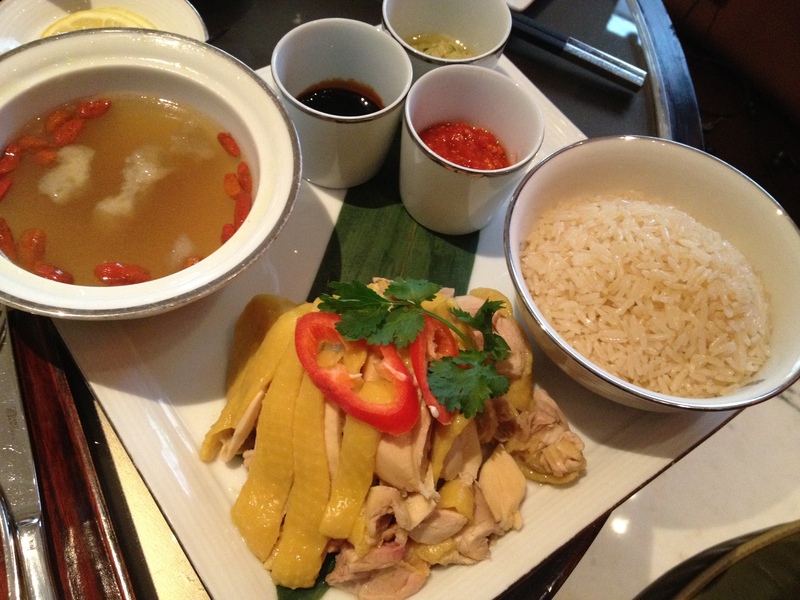 Whether or not it is the best Hainan Chicken Rice in town … well there’s only one way to find that out. Ahhh, the things I must do in the name of research…watch this space! As we sat people watching, we also noticed a lot of burgers coming out of the kitchen, and I overheard the table next to us say that MO Bar is famous for their club sandwiches. 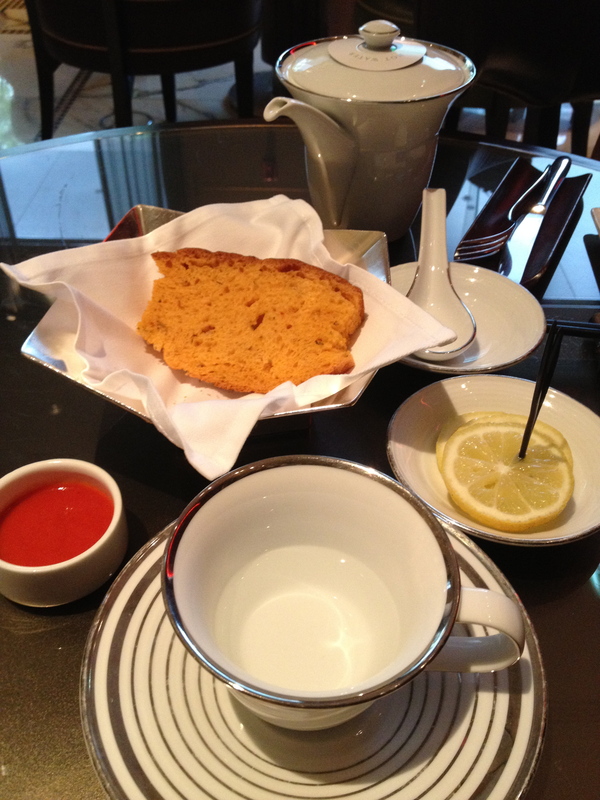 MO Bar also serves afternoon tea on Monday – Saturday 3pm – 5:30 pm, and Sunday 3:30 pm – 5:30 pm. Their little cakes and sandwiches are almost too pretty to eat – certainly food for thought as I plan my next visit to this establishment. Dress code, opening times and downloadable menus – click!